A produce manager holds a cut cantaloupe in Denver on Friday, July 13, 2012. 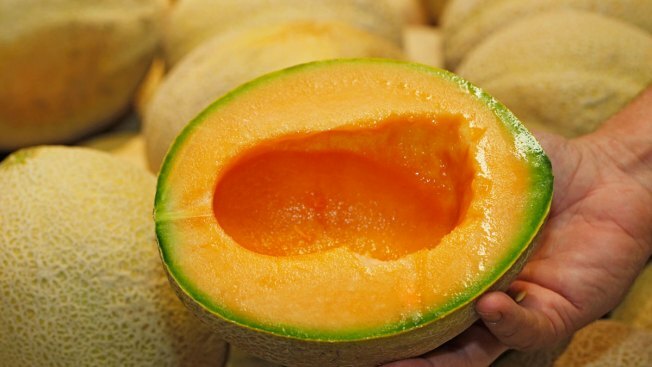 Health officials on Thursday added 10 more states to the list of retail locations that may have received cut melons possibly contaminated with salmonella, bringing the total number of states to 23. Last week, the Centers for Disease Control and Prevention said Caito Foods LLC recalled pre-cut watermelon, honeydew melon, cantaloupe and fruit medleys containing at least one of those melons that were produced at its facility in Indianapolis. The CDC said the fruit was distributed and sold in clear plastic clamshell containers at Costco, Jay C, Kroger, Payless, Owen's, Sprouts, Trader Joe's, Walgreens, Walmart and Whole Foods/Amazon. The FDA has posted a full list of retailers and locations where it believes the contaminated melon was sold. According to the CDC, at least 60 people became ill between April 30 and May 28 in five Midwestern states, where the outbreak was initially reported. Symptoms of salmonella include diarrhea, fever and abdominal pain that begins 12 to 72 hours after eating the contaminated food. Most people recover in four to seven days.